Those of you who have read a few posts here may know that I am a huge fan of slow, cold-fermentation. The long, slow rise allows the flavor of the grain to fully develop without the yeast eating all the tasty sugars and enzymes. 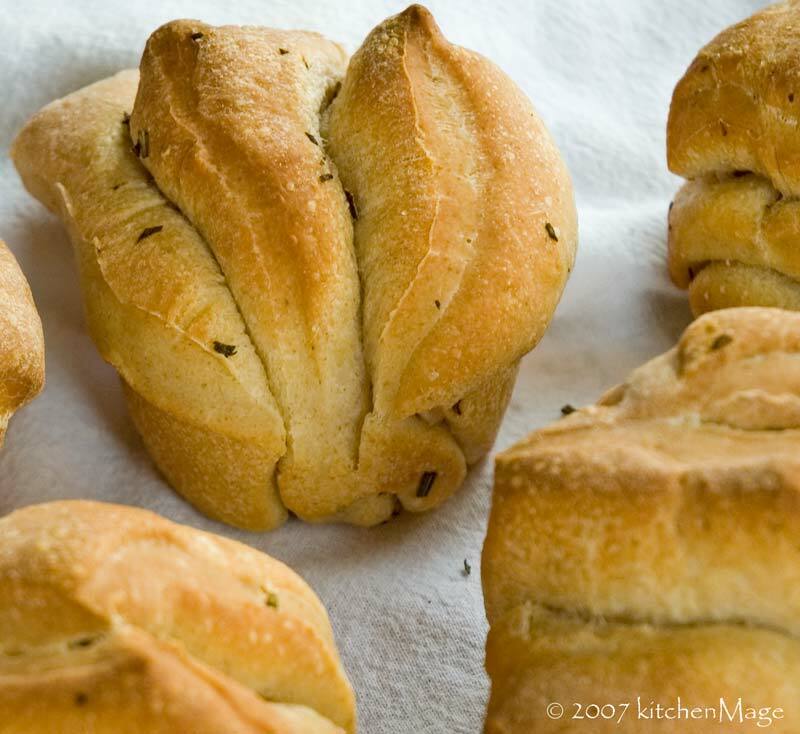 The ability to bake bread on your schedule, rather than the dough's, is also extremely useful. Most recipes can be made using this method, just start with cold ingredients, keep the dough cold while rising (use your refrigerator) and.reduce the yeast a bit — quite a bit it turns out. Therein lies the rub, or the knead. How much do you reduce the yeast? What is 'a bit' anyway? While wandering the tubes of the internet, a comment at The Fresh Loaf caught my eye. It contained, in theory, an actual formula for calculating the amount of yeast when adapting a recipe to slow fermentation. Since cold fermentation is, by definition, very slow, this seemed like a great starting place. Curious about the accuracy of the math, I tried it on a handful of recipes that I am familiar with and it worked. 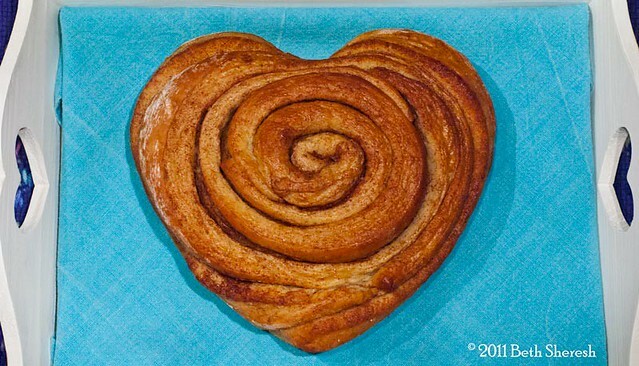 This is kind of exciting because it means most bread recipes can be made tastier and more easily. Seems like a win-win to me. I am moving recipes over from A Year in Bread before it goes dark. First: Cheddar Cheese Onion Breadsticks Step away from the Olive Garden breadsticks and try them. You will never go back. When I was a young'un, I moved from "Baja Oregon" to a very small coastal town in southwest Washington. A town where the locals joked, in some cases bragged, that, upon arriving, you should turn back your clock 20 years - to the '50s. (um, no) A town where, in the only 'ahead of their time' moment I witnessed there, they hated Calif…er, Baja Oregonians with a vengeance. Some folks (read: young men, sadly, with an emphasis on the young in all its myriad dreadful meanings) were utterly fascinated by the strange creature in their midst and vacillated between semi-awe and hormonal stupidity with occasional forays into West WTF. The strange creature, being a child of the coolest artistic little beach towns in Baja Oregon, thought this was mildly amusing behavior...for about 15 minutes. I arrived in late-spring and my first summer there was, to put it mildly, not my best year. Two things saved me that wet, foggy summer. The first was a job at the local pizzeria, where Gina, a wise-cracking New Jersey girl — everyone swore we were sisters — taught me to toss rounds of dough high in the air and, much harder, catch them again. She also let me play with the brick oven. 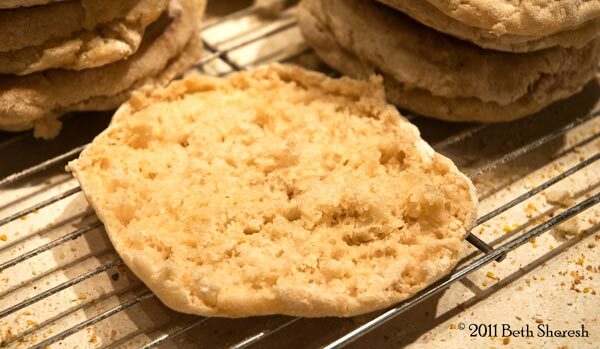 I started with this recipe: English muffins and crumpets: an (almost) shared recipe and while it's closer to what I want, it's still not quite there. One of the very few things I can eat on my not so good days is English Muffins, hence the recipe tweaking. The next batch will be get a little more water and be cooked in rings. Photos soon. I hope. Late summer is fair time round these parts. Our tiny county fair has the essential treats: corn dogs, cotton candy, elephant ears...but the whole fried-thing-on-a-stick phenomenon has passed us by. Whether this is good or bad is debatable - fewer calories v. no deep-fried snickers, you make the call - but it leaves a gaping hole in my excuses to eat deep-fried food. Were it not for the Walla Walla Sweet Onion Rings that Burgerville tempts me with each summer, I might go a year without anything cooked in boiling fat. While shaping bagels today, I was struck with a thought I am blaming on my proximity to the local fair: deep-fried bagels. Yeah, I said it. 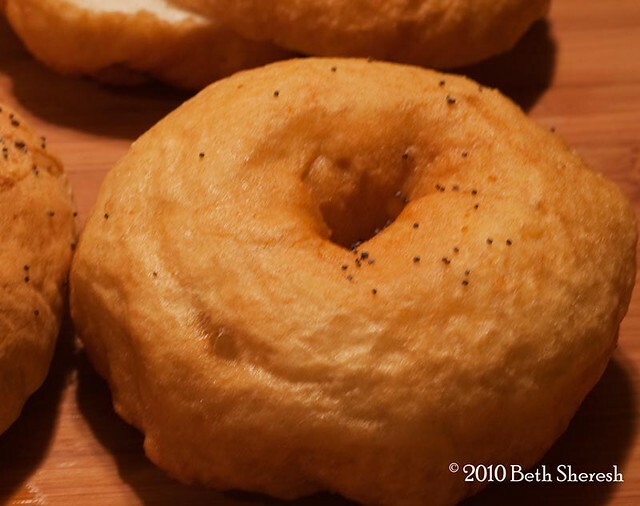 Deep-fried bagels. We will now pause for a moment as our various bubbes plotz about this meshuggah idea.